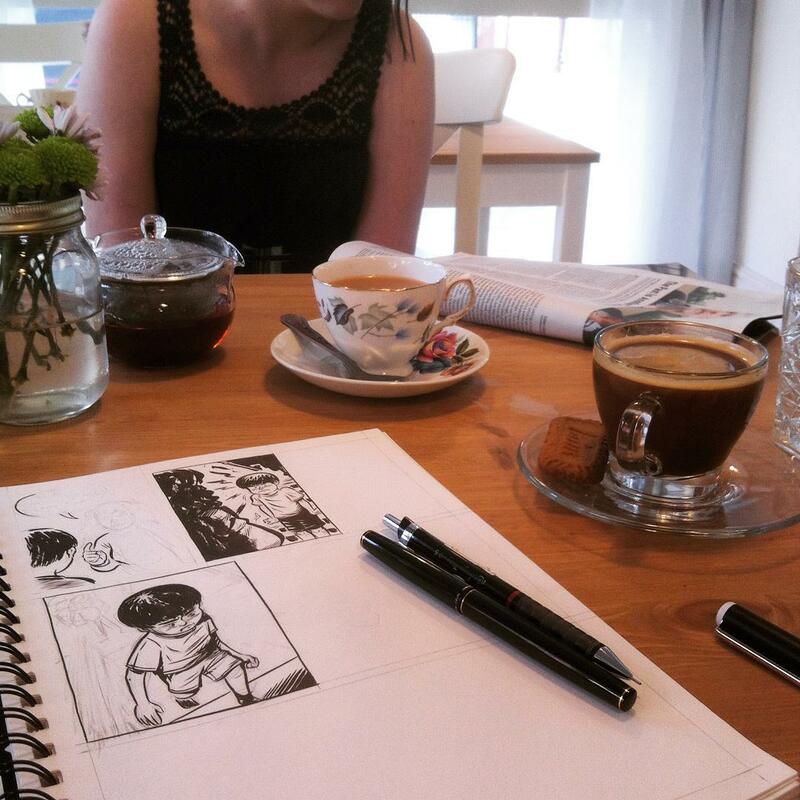 This month, I've started making some headway in drawing the fourth issue of Killjoy. My usual drawing process requires a little preparation before I actually make the first marks on paper - that is, clearing space on my cluttered desk before setting up my drawing board (I use a Reeves' Art and Craft Workstation, A2 size, which is effective and inexpensive) and preparing whatever drawing materials I plan to use. As a result, I've only tended to make 'finished' work during occasional, preplanned sessions on free days or evenings. As I intend to make single issues of Killjoy a little longer from now on, I'm making use of smaller pockets of free time - lunch breaks, idle café visits, &c. - in the production of comics. To this end, I'm drawing a number of strips in a sketchbook (Daler Rowney Ebony, spiral-bound), with a brush pen (a Kuretake No. 13 filled with Platinum Carbon ink). I must admit to a little former preciousness in respect of art materials - that sketchbooks and pens might not be 'proper' tools for 'serious' drawing, even though I've always theoretically agreed with Derek Kirk Kim's opposite opinion. However, I've become increasingly aware that brush pens are regularly used to brilliant effect by cartoonists whose work I could never hope to match: Frederik Peeters uses the Pentel Pocket Brush to draw his beautiful comics, and Blutch apparently keeps multiple brush pens to hand - and Kaz once told me that he began drawing Underworld with a brush pen in his sketchbook after a move that left him pressed for time. And, of course, to be a tools snob makes one a tool. The only concerning disadvantage with this method is that bending over a horizontal sketchbook is painfully niggling a trigger point in my back. I'll probably draw about one-third or half of the issue in this manner, before moving back to a static, posture-friendly setup in a month or two.